It was no coincidence that CareOregon opened its doors on Feb. 1, 1994, the same day that the Oregon Health Plan officially launched. A year before, health care leaders from the Multnomah County Health Department, Oregon Health & Science University (OHSU) and the Oregon Primary Care Association came together to create a health plan that could ensure high-quality care to low-income Oregonians. CareOregon is a safety net nonprofit health plan serving the health care needs of low-income Oregonians. They serve approximately 200,000 Oregon Health Plan (Medicaid) and Medicare members and their communities. From the start, CareOregon’s leadership believed that preventive services and support for chronic conditions was the key to providing the best quality care while reducing costs. They met those goals by addressing both physical and behavioral health needs, while helping members break down the social, emotional and economic barriers to overall well-being. 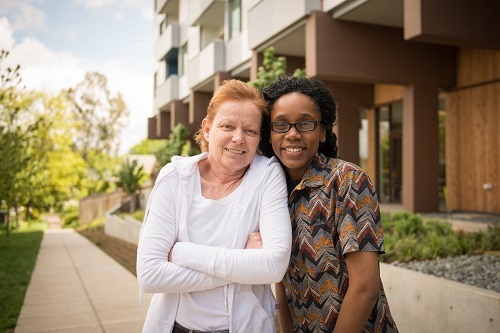 This holistic model of care, developed over two decades, continues to inform CareOregon’ programs, services and partnerships today, and has led to national recognition as a world-class innovator. CareOregon’s focus on innovation is fueled by the belief that collaborating with members, their families, providers and communities can help transform health throughout the state. CareOregon serves both Medicare recipients and Oregon Health Plan (OHP) members through partnerships with four Coordinated Care Organizations (CCOs) and two Medicare plans. CCOs bring together physical, dental and behavioral care, and addiction treatment, for people covered by OHP. CCOs address the underlying determinates of health and well-being. Serving the whole person through coordinated care is the cornerstone of CareOregon’s commitment to its members, reflecting its overarching goal of making high-quality health care available to all Oregonians, regardless of income. CareOregon works with four of the 16 CCOs in Oregon. They partner with Health Share to serve the tri-county Portland metro area, own Jackson Care Connect and Columbia Pacific CCO, and contract to provide administrative services for Yamhill County CCO.